The forthcoming Minibike World Championships is not just all about the Pro’s as there is a whole host of younger racers looking to battle it out to become a World Champion. One of the stand out competitors in the MBC Youth 12 t0 14 year old 125cc class is Louis Dutton who has forged ahead in the championships standings after some intense battles with his closest rival Ewan Goddard. We caught up with Louis and found out more about him and his Minibike World Champs ambitions. Hey Louis tell us a bit about you, your age, where your from, what you do and your racing background? Hi, I am 14 years old and I live in Suffolk. I have been riding since I was 3 yrs old & started racing at 6. 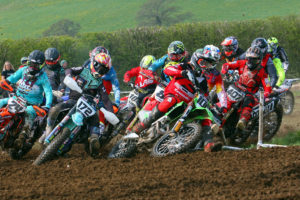 I currently race in the British Minibike Championship and I also do various motocross races, trials and some enduros. I also have a YouTube channel which I upload moto vlogs on each week called Louis Dutton Vlogs. I come from a racing back ground, all my family raced, my grandad raced sidecars at the Isle of Man TT, my Dad raced motocross, his uncle came 2nd in the 500cc world championships & my cousin Elliott Banks Browne is 2 time MX2 British champion. How did you get into Minibike racing? I broke my arm racing motocross in the 65’s and then on my first race back I broke it again so was out for a while, when it was healed again to get back into racing I saw a advert for the minibike champs at Action park in Essex so I went there on my crf110 and and loved it. The track was mega, it was well organized so I wanted to do do another round so just carried on doing them. You are leading the 12-14 125cc class of the MBC at the moment with some great recent results, does that give you confidence going into the World Champs? Yes it gives me a lot of confidence with 7 round wins at of 8 so far & I feel I can carry that form into the world championship and hopefully win. Who is your biggest Minibike Rival? This year my rival has been Ewan Goddard, its been really close all year with me and Ewan 1st & 2nd. But we’re good friends off track. As well as your UK rivals you will be racing against kids from other countries are you excited by that or daunted by that? I’m not daunted by it but just excited to be racing against some different riders. The MBC are renowned for creating fantastic race tracks, what are you expecting from the World champs track at Fat Cats, and what type of track’s do you prefer? Jamie and the minibike crew always do a great job doing the tracks and my favorite kind of track is sand with big jumps so should be good. Is there anything different or special that you are doing in the build up and at the World Champs? My cousin Elliott has been helping me train and I have been out on my 85 riding in the sand. I see there is an Alex Dutton entered for the 9-11 class, any relation? Yeah Alex is my younger brother and this is his first year racing Minibike Champs. Who in Minibike racing do you look up to and who are you rooting for in the Pro Class of the World Champs? My favorite rider is Bradley Pocock he is a awesome rider. So I will be rooting for Brad. Who are the biggest influences on your career? My Dad for always taking me riding and keep on pushing me & my cousin Elliott Banks Browne for advice and help. What would it mean to become World Champion? I can’t believe I have a chance to race in a world championship with a chance of becoming one. That’s the sort of thing I dream about & would be amazing if I WON. What would you say to anyone your age looking to get involved in the Minibike World Champs? Minibike champs is such a great place to race for riders of all abilities, its also great fun to watch so get yourself to Fat Cats. You certainly know how to promote your sponsors and you do a fantastic Vlog tell us about that and how it started? I only started vlogging late last year when I built a minibke track at home, I brought a camara as I wanted to film making the track and it started from there. I love filming and vlogging and My channel has really grown quite fast. I have now got over 15,000 subscribers which is going up daily & my vlogs have had over 2.5 million views. Would like to thank my Mum & Dad for everything they do for me, Elliott for all his help, Owkay Clothing, Gary at UN Bikes , Callun at CW Bikes, 151’s, Hawkes Car Centre, Generate Products and Thanks to Dirt Hub. Where on social media can people follow you? 2018 Minibike World Championships this weekend – What you need to know!